This book re-imagines the relationship between love, poetry (and literature more generally), and literary/theological/philosophical criticism of poetry going all the way back to the Augustan era in Rome. The book tells a story, relates a history of love, through literature and its sometimes adversarial relationship to the laws and customs, the political and economic structures of the times and places in which that literature was produced. But it is also relates a history of the way love has been treated, not by our poets, but by those our culture has entrusted with the “authority” to maintain and perpetuate the understanding, and even the memory, of poetry. Together with the tradition of love poetry has grown a tradition of criticism that tends to argue that what merely seems to be passionate love poetry is actually properly understood as something else (worship of God, subordination to Empire, entanglement within the structures of language itself). 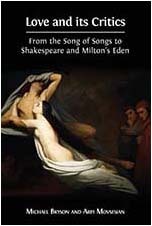 The pattern of such criticism—from the earliest readings of the Song of Songs to contemporary articles written about a carpe diem poem like Robert Herrick’s “To the Virgins to Make Much of Time”—is to argue that the surface or exterior of a poem hides the “real” or “deeper” meaning, and that it is the critic’s job to pull back or tear away that surface in order to expose what lies beneath it. Employing a method Paul Ricoeur called “les herméneutiques du soupçon” (the hermeneutics of suspicion), such a reading strategy is a matter of cunning (falsification) encountering an even greater cunning (suspicion), as the “lies” and “false consciousness” of a text are systematically exposed by the critic. In essence, this book is an attempt to defend poetry against a kind of criticism that treats poetry as an illusion that needs to be debunked or an opponent that needs to be defeated. 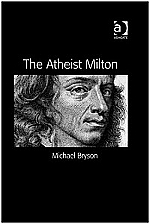 My argument is two-fold: based on his association with Arian ideas (denial of the doctrine of the Trinity), his argument for the de Deo theory of creation (which puts him in line with the materialism of Spinoza and Hobbes), and his Mortalist argument that the human soul dies with the human body, that Milton was an Atheist by the commonly-used definitions of the period. And as the poet who takes a reader from the presence of an imperious, monarchical God in Paradise Lost, to the internal—almost Gnostic—conception of God in Paradise Regained, to the absence of any God whatsoever in Samson Agonistes, Milton is the poet of the atheists, pushing harder against that old “task-Master” than any poet before or since. "The Gnostic Milton: Salvation and Divine Similitude in Paradise Regained"
The New Milton Criticism. Eds. Peter C. Herman and Elizabeth Sauer, Cambridge UP, 2012, 102-19. Approaches to Teaching Paradise Lost. 2nd ed. Ed. Peter C. Herman. MLA Press, 2012, 76-83. In Milton and the Visionary Mode: Essays on Prophecy and Violence. Eds. Peter E. Medine and David V. Urban. Duquesne UP. pp. 241-265. "The Mysterious Darkness of Unknowing: Paradise Lost and the God Beyond Names." A book chapter for a collection on the 1667 edition of Paradise Lost edited by John Shawcross and Michael Lieb (forthcoming from Duquesne UP). "The Negation of “God”: Samson Agonistes and Negative Theology--a chapter-length paper currently being prepared for a long form presentation in Chicago at the Newberry Library Milton Seminar in May 2005, and a shorter form presentation at the International Milton Conference in Grenoble, France in June 2005. 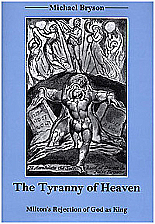 The Tyranny of Heaven: Milton’s Rejection of God as King U. Delaware Press. Read a sample of this book, or buy an e-book edition here. Religion and Literature 37.3 (Autumn 2005) 127-36. The Quest for the Fiction of an Absolute--an essay (in need of some reworking before attempting journal publication) on mysticism in two poems by Wallace Stevens. Turn, Turn, and Turn Again--a brief essay on "honesty" and "whoredom" in Othello. Alchemy, Witchcraft, and the Magus Figure in The Tempest--notes for a class discussion/lecture. Reclaiming the Self: Transcending the Fragmentation of the Individual Subject--an only slightly altered version of my MA thesis (from 1996), parts of which I may (or may not) return to in order to develop more fully.